Worthing Town Leisure Football Club won their first-ever match in the Southern Combination League when they beat Rustington 4-0 on Tuesday evening. Leisure were promoted as Brighton & Worthing League champions last season but had their match with AFC Roffey postponed on Saturday, as Roffey have withdrawn from the league. Rustington had lost 5-1 at Alfold on Saturday and it took Leisure just four minutes to go ahead through 17-year-old James Lelliott with a low left-foot shot. Ricky Neenan made it 2-0 just eight minutes later from Lelliott’s through ball and Greg Clark got the third on 37 minutes. Clark then scored his second when he lobbed home nine minutes into the second half as Leisure recorded a comfortable win. The day was not quite as smooth as Leisure would like, though, as four of their players’ registrations did not come through in time - which meant late changes to the squad. 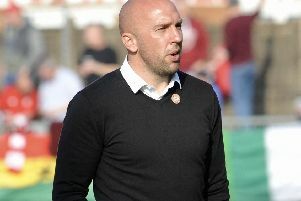 Leisure boss James Everett said: “We had big problems just before the game as we found out four players weren’t eligible as their registrations hadn’t come back in time. “We phoned up a couple of players at the last minute to help out and we had to change the team around quite a bit. “It’s something we’ll learn from as a club but I said to the lads afterwards, with all the changes we had to make, it was a brilliant start. Leisure travel to Upper Beeding on Saturday (3pm), before they entertain Ferring on Monday (11am). LEISURE: Everett; Soro, Wenham, Backler, Botley, Kiayr, Clark, Geere, Neenan, Jenkins, Lelliott. Subs: Wiseman, Martin.